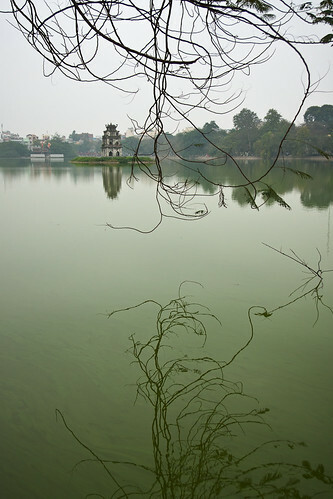 Last week, we spent a few days in Hanoi, Vietnam's capital. More dignified, stylish, charming, and less frenetic than Saigon. Though not nearly as tranquil as this shot may make it appear. And traffic may be less busy than Saigon, that is compensated for by a more aggressive driving style. Less busy, but in the end, scarier. I did not spend as much time looking around as I wanted to, distracted as I was by some offerings to the porcelain god. So for now only a few superficial impressions and comparisons to Ho Chi Minh City. First and foremost, Hanoi is a lot better in maintaining its history. The old town still has many French colonial buildings, and the entire district is still laid out as before - organised by guild (Cotton Street, Bamboo Street, Fish Street, etc.) with really narrow and long 'tube houses'. Nice to see that not everything is being torn down for yet another gleaming highrise. Hanoi is almost 2 hours flying north. It is less sunny and a lot colder at this time of year (18°C vs. 34°C &dash;- or 65F vs. 94F). Finally, a little opinion: the people in HCMC seem a little friendlier and laid back, while the food is heartier up north (more meat, more deep fried, a little less fruit and veg).